The skin on the hands is incredibly delicate and is often overworked and under protected. Ageing hands can incur at a rapid rate as the hands often age faster than the face. The ageing process happens when the collagen and fat in the hands dissipate, causing the veins and tendons to become increasingly pronounced. The loss of smoothness and plumpness of the skin can result in a loss of volume and cause the hands to look and feel a lot older than the rest of you. 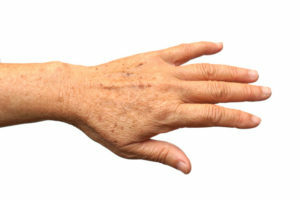 Ageing hands can be seen in both men and women from around the age of 25. To avoid the maturing of the hands, it is vital that a person uses quality hand cream on a regular basis in order to keep the skin smooth and hydrated. Having used Restylane products and Obagi Nu-derm creams for over 12 years, Dr Milojevic has the most thorough knowledge and specially designed combinations of these two treatments for brilliant anti ageing results for the ageing hands.